The European Adjustable Slat System. TEMPORARILY UNAVAILABLE - we've had recent problems with our manufacturer so we're currently researching other sources for our European Adjustable Slat system. Please check back often for an update or feel free to contact us at our toll free number to inquire about alternatives or make suggestions. Thank you! The Slat System is a popular alternative to traditional boxsprings. The Swiss invented this suspension system years ago and now almost 70% of Europeans choose the slat system. Although it is relatively new in the United States, our customers love the ease and customized support options. 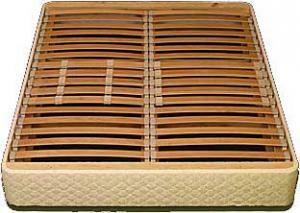 The curved wooden slats offer flexible support for your mattress, with no sag or roll-together. And because the slats are adjustable, you are able to customize your foundation to the firmness that best supports your back and hips, easing pressure points. The give and rotation of the slats constantly respond to your body’s needs. Although the feel is firmer than an innerspring system and you have the ability to make adjustments in the center area of the foundation. And because the slats allow air to flow through your mattress, it helps to eliminate the buildup of moisture in your mattress due to perspiration. Height: 7.5" Twin-Full size are a one piece slat, 10" Qu-King are two piece slat. SHIPPING CHARGES WILL BE EMAILED TO YOU FOR THIS ITEM, AND THEN ADDED TO YOUR ORDER. Custom made to order - Allow 2 weeks for production then 2-4 weeks for delivery. Note:Mattresses & boxsprings are non-returnable & non-refundable. Please ask about our exclusive one-time "comfort-exchange" program.